Conveniently placed links will allow you to move around within the page and back to the Supplement Page. Every supplement I offer is of the highest quality and purity and are manufactured according to the strict Good Manufacturing Practices (GMP) and adherence to United States Pharmacopeia (USP) standards. The facility manufacturing my supplements is certified by NFS International, an independent, third-party certification organization. In addition, the facility is licensed by the State of California and registered with the Food and Drug Administration (FDA). glutamic acid, and glycine. Glutathione exerts powerful antioxidant and detoxifying activity. maintains the integrity of blood cells, and helps transport amino acids across cell membranes. Free of the following potential allergens: dairy, wheat, yeast, gluten casein. No sugar, artificial sweeteners, colors, flavors, or preservatives. Good Manufacturing Practices (GMP) and adherence to United States Pharmacopeia (USP) standards. with the Food and Drug Administration (FDA). L-leucine, cellulose and silicon dioxide. sweeteners, colors, flavors, or preservatives. wrap is broken or missing. Store in a cool, dry place (500F to 850F) away from direct light. the Food and Drug Administration (FDA). shrink wrap is broken or missing. Store in a cool, dry place (500F to 850F) away from direct light. This product contains selenium, an essential trace element that works synergistically with vitamin E.
artificial sweeteners, colors, flavors, or preservatives. As a dietary supplement take one to six capsules daily or as directed by a healthcare practitioner. 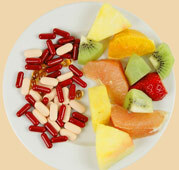 As a dietary supplement take two to four capsules daily or as directed by a healthcare practitioner. **Metafolin® is a registered trademark of Merck KGaA, Darmstadt, Germany . Suggested Use: 3 capsules twice daily with food. immune function, tissue repair, cardiovascular function, energy production, and healthy body processes. who wish to avoid taking this nutrient. L-leucine, silicon dioxide, and natural citrus flavor.